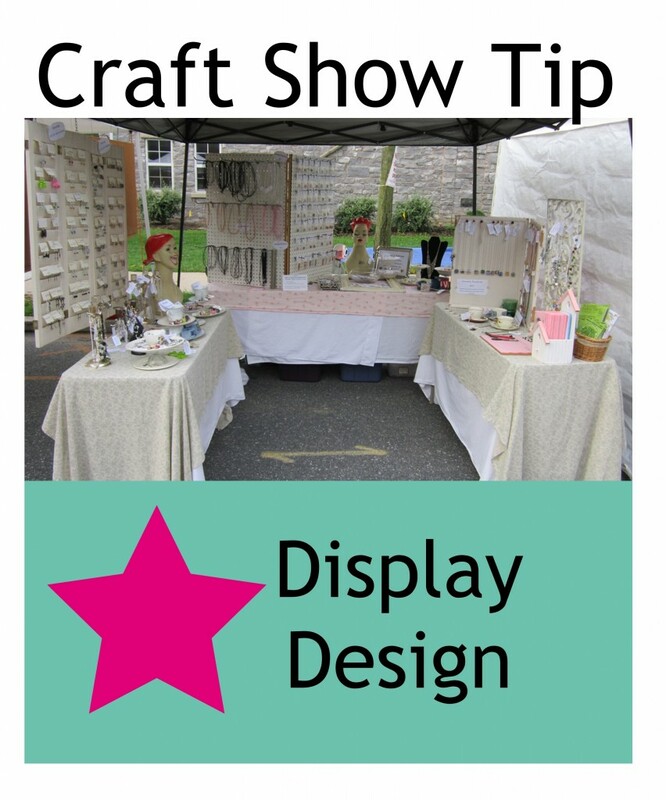 A well thought out and carefully planned craft show booth design can be the difference between everyone stopping in to see what you’re selling and people just walking by. Your displays are so very important. We want to think that our products are what is most important (and they are, of course), but you have to get someone to walk up to or in your booth before they can make a purchase. 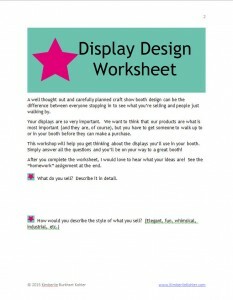 The questions here will help you get thinking about the displays you’ll use in your booth. Simply answer all the questions and you’ll be on your way to a great booth! After you complete the questions, I would love to hear what your ideas are! See the “homework” assignment at the end. Click the image above to get a PDF of this worksheet so you can download, save and/or print! 1. What do you sell? Describe it in detail. 3. Who are your customers? Describe as much about them as you can. If you don’t actually have any customers yet, you can make it up for now. 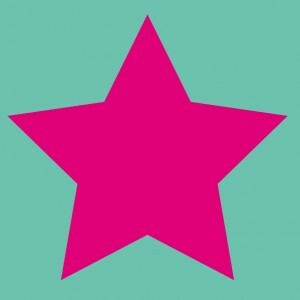 As you start doing craft shows you will find out more and more about them. 4. What would you like to convey to your customers? Think about this from afar. What message do you want to give them before then even set foot into your booth so they know this is a booth they should come in? 5. What colors fit into your style? 7. Brainstorm some ideas of what kinds of displays you could use to convey your message. Think outside the normal realm of what craft show displays are. Set a timer for 15 minutes and write down everything that comes to mind, regardless of if you think you can pull it off or not. 8. Now look at that list from the previous exercise and go idea by idea. Think of creative ways you could put the idea into practice. If it’s not logical, how could you make it more so? Maybe you could do it on a smaller scale. Think about the feeling you are trying to convey with that idea and how you could convey that feeling in a different way. For example, if you sell flip flops that you crochet or decorate in unique ways, you might want to have a beach or a boardwalk in your booth. Maybe it’s not practical to make an entire beach out of your stand, but maybe you could have a tray or a table that holds sand you could display your flip flops on. Maybe you could create the look of a boardwalk in your booth or make the top of your tables into mini boardwalks. 9. Now take it a step further. How could you put this together? What do you need to accomplish this? 10. Consider that you’re going to have to carry this around to craft shows. How mobile is your idea? How can you make it more so? How can you make it light? How could you make it easy to put up and take down. From my flip flop example, what can you use to construct a beach? Maybe you could just use a small tray that fits a couple pairs of flip flops that you could fill with stand or maybe several trays. You could have a tub that you carry the sand in and just fill up the trays at the show. At the end of the show you dump the sand back in the tub and pack up. 11. What do you need to learn or who can you call on that has the skills you need? In the flip flop example, you may not have constructions skills to make a mini-boardwalk on a display table, but maybe your bother does. Maybe you want to make a big tray for the top of a table. Can you construct it? Who has the tools or skills you need to accomplish it? Your ideas don’t have to be big and grand like that. In my Craft Show Tips eBook I dissect my booth display for you. My craft show booth doesn’t have any big, extravagant pieces, but I always get a lot of compliments. I always have a lot of people coming in my booth. I use colors and unique display pieces to convey my style and to attract the customers that want what I sell. Make sure to take the colors from the question above into consideration as well as your style and who your customers are. 12. Now, make a list of everything you need. Reevaluate if it is practical for traveling to craft shows, setting up in the morning before a craft show and of course tearing down and traveling home with it. Do you have room to store the displays in between shows? Next week I’ll be talking about where you can get displays (traditional places and not so traditional places). Have your list ready and I’ll have ideas for you to actually start pulling your booth together. Email me (Kim@KimberlieKohler.com, put Craft Show Display in the subject line) your list of everything you need from the last question. I would love to address specific ideas you have and give you ideas of where to get them! Join the Craft Show Tips newsletter and get weekly Craft Show Tips right in your inbox! Plus get a craft show packing list when you sign up! This entry was posted in Business, Craft Show Tips and tagged craft show tips, display, display design, PDF, worksheet by Kimberlie. Bookmark the permalink.